The Silly Symphony Swings are nestled in the middle of Paradise Pier! After what feels like an incredibly long delay, today we begin our recap of things that we saw and experienced during our trip. In today’s post, we’re taking a look at one of the sleeper attractions at the Disneyland Resort — the Silly Symphony Swings! This is just a standard sort of attraction, nothing too special about it, except that it features music from the early Disney series of cartoons called the Silly Symphonies! My niece Stephanie’s husband Shane took this video of the ride when he rode it in July, and here it is for you to see what you think of it. It has great music accompanying it, as well as some great views of the Paradise Pier section of California Adventure! Have a look, and enjoy! 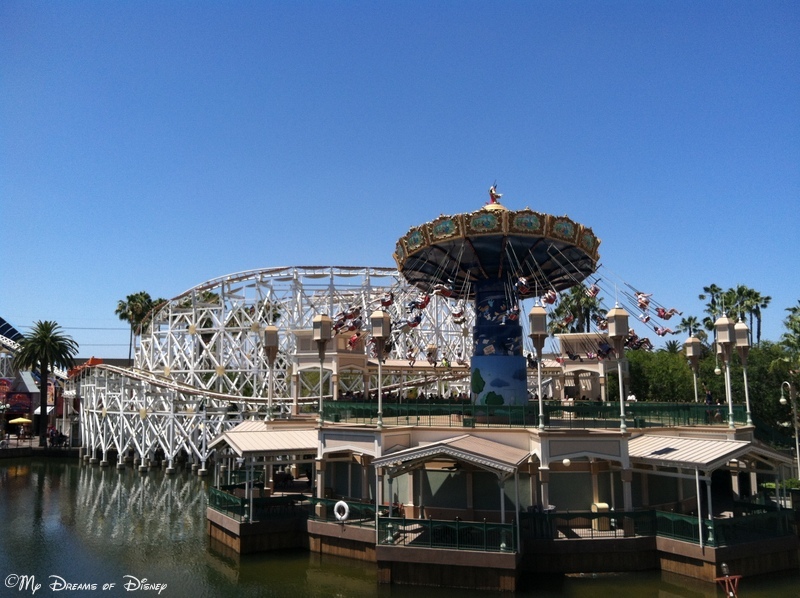 What did you think of the Silly Symphony Swings video and ride? Does it make you want to go ride the attraction yourself? I think that this is one of those attractions that I’d love to have over at Walt Disney World. What do you think? Let us know in the comments below, and thanks for stopping by! The empty swing makes me wonder if simply remaking this ride was the way to go.aybe it should have removed and replaced with something new? Hey Lee, thanks for your comment! I hear you with regards to all the seats not being filled, but I think that is partly to do with all the hoopla that was going on in other parts of the park and over at Disneyland. For me the draw of this attraction is almost entirely the throwback music and how it takes me back to those Silly Symphony Cartoons. I would love to see it at WDW!